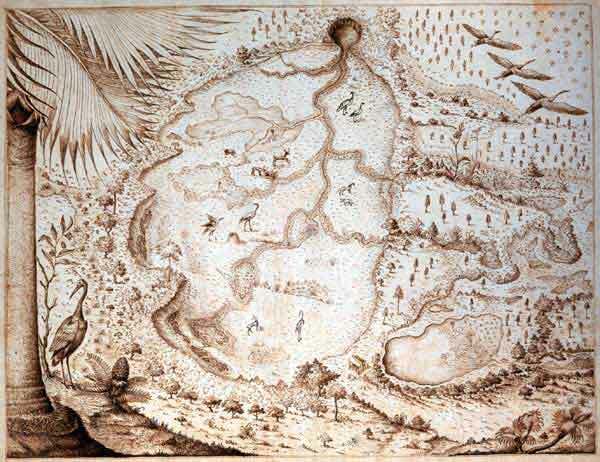 "The great Alatchua-Savana in the Province of East Florida, above 60 miles in circumference near 100 miles west from St. Augustin, & 45 miles west from the River St. Juan," by William Bartram, circa 1774. In his "Report" to Dr. John Fothergill, The Englishman who sponsored his travels in the southern colonies, Bartram wrote "Behold, a vast Plain of water in the middle of a Pine forest 15 miles in extent & near 50 miles in circumferance, verged with green level meadows, in the summer seasons, beautifully adorned with jeting points & Promentorys of high land. The prospect is greatly beautified by the Prodigious Numbers of Wild fowl of various kinds....It may be termed the Elisium of Birds, & happy was he that reach't it..."
Florida History Online is a digital archive of textual and visual documents of Florida history produced by students and faculty at the University of North Florida. The web pages explore the complex historical legacy of Florida with interactive maps, primary documents, time-lines, portraits, biographies, searchable databases, scholarly analysis, interpretive narratives, lesson plans for educators, and other tools of digital technology. Florida history will be placed in the wider context of American and Atlantic World history. Florida History Online is an educational website intended as a resource for teachers and scholars, students at all grade levels, and the general public. It offers free online access to transcribed Florida history documents. Ideas and contributions by scholars and students from other departments and institutions, and cooperative arrangements with historical societies, libraries, and archives are encouraged. Communication about the website should be addressed to Daniel L. Schafer, Professor Emeritus of History, University of North Florida, at dschafer@unf.edu. The textual documents and images on this website are intended for educational and non-commercial purposes only. They are presented here for the personal use of students, teachers, scholars, and the general public. Commercial use or publication of the textual documents or images is strictly prohibited. Many documents and images used here are the property of copyright holders who have granted permission for presentation on this site only. Permission for other applications can only be secured by contacting the copyright holders directly. The authors of this website cannot be held responsible for any infringement of copyright by other parties. Persons viewing this website may download or make links to non-copyright images for preparation of websites for public, non-commercial use. In such cases a citation to the holder of the image should be included and an acknowledgment of this website would be appreciated.